Gnoppix was a Linux live CD based on Ubuntu Linux. It can be compared to Knoppix, but Gnoppix uses GNOME as the desktop environment. 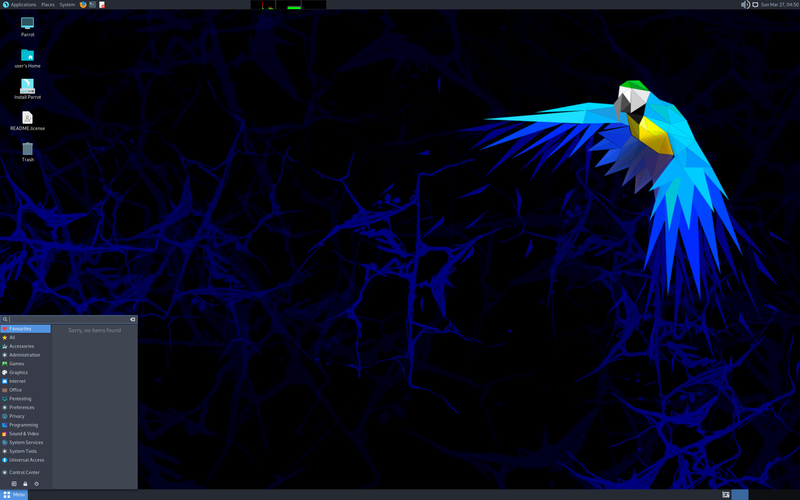 Rate this project Lorenzo Faletra has announced the release of Parrot Security OS 3.9, an updated build of the project's specialist distribution featuring a collection of tools for penetration testing and forensic analysis, based on Debian's "Testing" branch. This release brings a major new feature - an introduction of application sandboxing via Firejail: "Parrot 3.9 is now ready and it includes some important new features that were introduced to make the system more secure and reliable. The most important feature is the new sandbox system, introduced to protect many applications from 0-day attacks out of the box. The sandbox is based on Firejail, a suid program which is very easy to configure and customize to protect many critical applications in a quick and effective way (if an application does not work as expected, customize the corresponding Firejail profile to be more permissive). The other characteristic of this release is a long list of little details we wanted to fix to make the system look better, and the new Debian updates we have introduced to include the latest technologies." Read the brief release announcement for further information. Download: Parrot-full-3.9_amd64.iso (3,645MB, SHA512, torrent, pkglist). Lorenzo Faletra has announced the release of Parrot 4.5, the latest stable version of the project's specialist distribution designed for penetration testing, digital forensics and privacy protection, based on Debian's "Testing" branch: "Parrot 4.5 is officially released and there are some major changes under the hood. We are in 2019 now, and computers that are not capable of running 64-bit operating system are mostly legacy computers that are not capable of running modern and complex applications. Additionally, many programs and frameworks are no longer available for 32-bit x86 systems. We have been releasing 32-bit images since the beginning of the project and we worked hard to provide fresh binary updates for the i386 architecture for a while, but nowadays 32-bit-only computers are no longer capable of running a full pentest campaign or providing hardware-accelerated support to our security protection systems. Parrot 4.5 no longer provides live ISO files for the i386 architecture." Read the comprehensive release notes for further details. Download (SHA512, signature, pkglist): Parrot-security-4.5_amd64.iso (3,793MB, torrent), Parrot-home-4.5_amd64.iso (1,898MB, torrent), Parrot-kde-4.5_amd64.iso (2,003MB, torrent). Lorenzo Faletra has announced the release of Parrot 4.3, a new stable build of the project's Debian-based distribution with a collection of utilities for penetration testing, digital forensics, programming and privacy protection: "Parrot 4.3 is now available for download. This release provides security and stability updates and is the starting point for our plan to develop an LTS edition of Parrot. Changes: Linux kernel has been updated to the 4.18.10 version; Firefox 63 provides noticeable security and privacy features, but it is no longer available for 32-bit systems, so we switched to Firefox ESR on all the unsupported architectures. WINE menu - we have fixed a bug in the Parrot menu configuration that prevented several menu categories to show up; the Parrot .bashrc file has been updated, now it provides better snap support, the ll alias now shows the size in a human readable format and it does no longer overwrite some global settings as it used to do before; OpenJDK 11 is now the default Java provider; Anonsurf has received important stability upgrades and now it does not mess up the DNS configuration; new Parrot icons...." Continue to the release announcement for more details and upgrade instructions. Download (SHA512, pkglist): Parrot-security-4.3_amd64.iso (3,786MB, torrent), Parrot-home-4.3_amd64.iso (1,764MB, torrent). A new (experimental) KDE Plasma edition is now also available: Parrot-variant-kde-4.3_amd64.iso (1,698MB). Lorenzo "Palinuro" Faletra has announced the release of Parrot 4.2.2, the latest stable version of the project's a GNU/Linux distribution based on Debian's "Testing" branch and focused on penetration testing, digital forensics, programming and privacy protection: "We are proud to announce the release of Parrot 4.2. It was a very problematic release for our team because of the many important updates under the hood of a system that looks almost identical to its previous release, except for a new background designed by Federica Marasà and a new graphic theme. Parrot 4.2 is powered by the latest Linux 4.18 Debianized kernel with all the usual wireless patches. A new version of the Debian installer now powers our 'netinstall' images and the standard Parrot images. Firmware packages were updated to add broader hardware support, including wireless devices and AMD vega graphics AppArmor and Firejail profiles were adjusted to offer a good compromise of security and usability for most of the desktop and CLI applications and services." Read the release announcement for more information and screenshots. The distribution is available in "Security" and "Home" editions; download links (SHA512, pkglist): Parrot-security-4.2.2_amd64.iso (3,689MB), Parrot-home-4.2.2_amd64.iso (1,752MB). A network installation image is also available: Parrot-netinst-4.2.2_amd64.iso (44.0MB). Parrot Security OS is a Debian-based, security-oriented distribution featuring a collection of utilities designed for penetration testing and computer forensics. The project's latest release, Parrot Security OS 3.11, includes fixes for Metasploit and PostgreSQL as well as a new automobile hacking menu which includes tools for testing real world cars. "This new release introduces many improvements and security fixes compared to the previous versions. It includes by default all the Spectre/Meltdown security patches currently available and an updated version of the Linux 4.14 kernel. A new car hacking menu now contains a collection of useful open source tools in the automotive industry to test real world cars or simulate CANBus networks. Metasploit and PostgreSQL are now patched to work flawlessly out of the box in live mode. Other important updates include Firefox 58, increased installer stability, many updated security tools and some important graphic improvements." Further information can be found in the project's release notes. Download: Parrot-security-3.11_amd64.iso (3,613MB, SHA512, torrent, pkglist). Parrot Security OS is a Debian-based, security-oriented distribution featuring a collection of utilities designed for penetration testing and computer forensics. The project's latest release, 3.8, is based on Debian's Testing branch ("Buster") and includes support for working with ZFS storage volumes. "I am proud to announce the official release of Parrot 3.8, that introduces many new features and updates. A quick look at our changelog will immediately spot the most important changes: First of all, the new Parrot 3.8 is now based on Debian 10 Buster (current Debian Testing release) with Linux 4.12, ZFS support, better wireless drivers support and the introduction of the new MATE 1.18, GCC 6.4 and 7.2, Java 9 and so on, and all the Parrot flavors now include Electrum, a lightweight bitcoin client. We have not only fixed the previous DNS resolution issues, but also introduced a new round-robin model between both the default DNS servers provided by DHCP and our new OpenNIC DNS nodes hosted on our servers to prevent DNS censorship. Our OpenNIC nodes were not yet added to the OpenNIC server list but we would love to add them in the future." Additional information can be found in the project's release notes. Download: Parrot-full-3.8_amd64.iso (3,574MB, SHA512, torrent, pkglist). The Parrot Security team have announced a new update to their Debian-based, security and penetration testing distribution. The new release, Parrot Security OS 3.7, introduces mostly small improvements and fresh package versions, compliments of Debian's Testing branch: "Of course the release of Debian 9 as the new Stable branch brought many important changes in Debian, but for those distributions based on Debian Testing, the main change was the introduction of many many updated packages that remained locked in the Unstable branch because of the pre-release testing freeze. We decided to not introduce significant changes on our side in this new release, and we just wanted to focus on making existing things better. The most evident change is the introduction of the ARC theme, while also the auto-updater received an important change to show the progress of system upgrades. The old Linux 4.9 kernel was replaced with the new 4.11 branch, and this introduced a better support for many devices." Further details can be found in the project's release notes. Download: Parrot-full-3.7_amd64.iso (3,593MB, SHA256, torrent, pkglist). Lorenzo Faletra has announced the release of Parrot Security OS 3.6, an updated build of the project's Debian-based specialist distribution featuring useful tools for penetration testing, forensic analysis, hacking, privacy, anonymity and cryptography: "After some months of hard work we were finally able to release Parrot Security OS 3.6. In this new version we didn't want to introduce new features and functionalities; we have worked instead on making the existing environment better, more reliable and less memory-hungry by applying many minor fixes to our build platform and packages and by tuning our startup daemons management system (Parrot 3.6 'Lite' 32-bit can use less than 200 MB of RAM). Anonsurf was improved too, and now the section dedicated to anonymity and privacy is very reliable and well tested, and some nightmares of the previous Anonsurf versions now belong to the past. We also wanted to give more attention to our 'Lite' and 'Studio' editions." Read the rest of the release announcement for more information. Download: Parrot-full-3.6_amd64.iso (3,345MB, SHA512, pkglist). Lorenzo Faletra has announced the release of Parrot Security OS 3.5, the latest update of the Debian-based distribution providing an array of specialist tools for penetration testing and computer forensics: "I am proud to announce the official release of the new Parrot 3.5 ISO files. This update took a lot of time (2 months) as we have not only updated and tested many packages from Debian, but we also tried to play with some new features and dropped some old and obsolete ones. This new release will no longer include all those old packages that did not meet the Debian standards, and of course we also removed the old and discontinued GtkDialog, that forced us to remove some other softwares built on top of it. On a brighter note, native VirtualBox and VMware guest support is now included by default. The Linux kernel was updated to the latest 4.9.13 release and we are waiting for Debian to finish the 'debianization' of Linux kernel 4.10 to start working on our patches for it." Continue to the release announcement for further details. Download the "Full" live DVD image from SourceForge: Parrot-full-3.5_amd64.iso (3,264MB, SHA512, pkglist).